“Electrification” is the new buzz word touted by climate fighters and environmental groups. Where electrification once meant providing electricity to people, today it often means elimination of traditional fuels. But the only tangible result of green electrification policies will be higher energy prices. Proponents of electrification intend to force transportation and heating and cooling systems to run on electricity, and eliminate the use of hydrocarbon fuels. Electric cars, electric furnaces and water heaters, and heat pumps must replace gasoline-powered vehicles and gas-fueled appliances. In addition, wind or solar systems must supply the electricity, not power plants using coal or natural gas, in order to reduce greenhouse gas emissions. California’s 2017 Climate Change Scoping Plan calls for a 40-percent reduction in greenhouse gas emissions by 2030 and an 80-percent reduction by 2050. Goals call for 4.2 million plug-in electric and plug-in hybrid cars on California roads by 2030, up from about 300,000 today. The plan also calls for electrification of space and water heating. Utility Southern California Edison (SCE) recommends an even more aggressive plan. 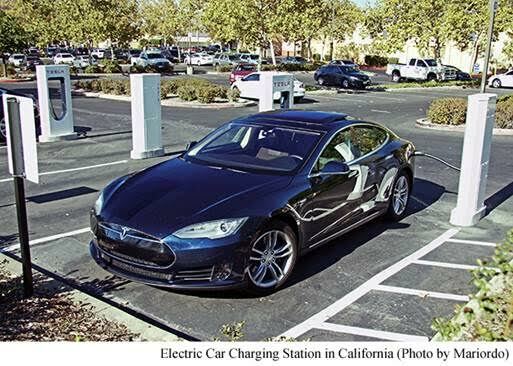 The SCE “Clean Power and Electrification Pathway” plan calls for 7 million electric cars on California roads by 2030 and for one-third of state residents to replace their gas-fired furnaces and appliances by 2030. Nine other states promote adoption of electric cars as part of a broad electrification program. New England states are exploring “strategic electrification” in order to meet tough emissions reduction goals. In most of these efforts, cost to consumers is rarely discussed. Electrification will be expensive. Most Americans don’t want electric cars. Large subsidies from taxpayers and mandates on auto companies and consumers will be required to force adoption. Furnaces and appliances powered by heat pumps, solar, and electricity are almost always more expensive than using natural gas or propane models. According to proponents of electrification, to reduce greenhouse gas emissions the sourced electricity must come from renewables. Therefore, all electrification programs promote wind and solar generation systems, backed up by battery storage. Today, the US is blessed with very low electricity costs. In 2016, the average wholesale electrical price, which is the price paid to generating facilities, ranged from only 2.3 cents per kilowatt-hour in the Pacific Northwest to 3.6 cents per kW-hr in New England. Coal, natural gas, nuclear, and hydroelectric, our traditional sources of power,delivered more than 90 percent of this low-cost electricity. Only 6.4 percent of our 2016 electricity came from wind and solar. Actual costs of wind and solar systems tend to be hidden from the public, but when disclosed, can be hideously expensive. The California Solar Ranch, which began operation in the Mojave Desert north of Los Angeles in 2014, delivers electricity at over 15─18 cents per kW-hr, more than four times the market price. The 2013 Massachusetts solar build-out was the result of a 25 cents per kW-hr subsidy paid to commercial solar generators, boosting the total solar price to almost 30 cents per kW-hr. But the Deepwater Wind Block Island project of Rhode Island takes first prize for outrageous renewable electricity cost. The five-turbine offshore system went into operation in 2016 at a contracted price of 23.6 cents per kW-hr, with an annual increase of 3.5 cents, placing the future price at over 40 cents per kW-hr. Who wants to pay ten times the market price for any product? According to the Energy Information Administration, on average US electricity prices increased less than five percent during the eight years from 2008 to 2016. 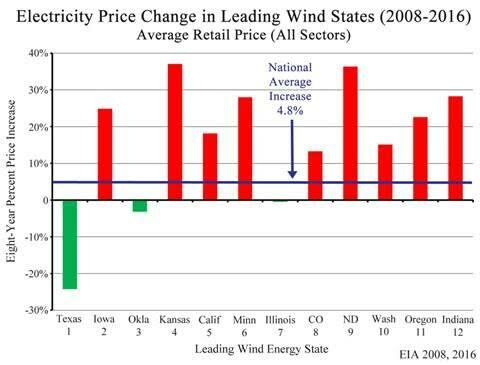 But over the same period, prices in nine of the twelve top wind states climbed between 13 and 37 percent, significantly higher than the national average increase. Commercial wind and solar systems are typically built far from cities, requiring new transmission lines, with costs passed on to electric rate payers. If electrification is adopted across our nation, look for escalating electricity prices. Electrification calls for a massive societal transformation from gasoline to electric vehicles, from traditional power plants to wind and solar generators, and from gas heating to electric and heat pump systems. There is no evidence that this transition will have any measurable effect on global temperatures. But electrification will produce substantially higher energy prices. Steve Goreham is an active speaker and writer on environment, business, and public policy. He is author, most recently, of the critically acclaimed primer, Outside the Green Box: Rethinking Sustainable Development. The German Green Party thought about ‘using all possibilities for electrification’ as a political aim for their last election programme. They thought twice and decided, only to use electrification where it makes sense. Electric energy is pure exergy which is the part of energy able to do work – like moving cars. So transport is good use for electrification and it improves the air quality in the cities, if not on the whole planet. Electric heat pumps are quite another thing, because they are turning pure exergy to lowex energy. This kind of energy should better come cogeneration (using waste heat from electric power generation), from solar thermal collectors and high efficiency boilers. Electric heating does not work well even in France, although they have nuclear power plants. As documented by the author, ‘electrification’ is code for nonmarket/uneconomic energy substitution. Another term for ‘electrification’ is ‘deep decarbonization’, which has been the domain of Mark Krebs here at MasterResource) (https://www.masterresource.org/?s=deep+decarbonization). Yes it has, but I’m glad to share it. Please defund NPR and PBS. Both have been captured by activists masquerading as journalists. Where climate is concerned, both have become nothing more than propaganda broadcasting operations. Several years ago, Duxbury, MA had planned to install two offshore wind turbines. $2 million dollars later, Duxbury abandoned this plan. The litttle town of Falmouth, MA is $10-20 million in debt due to just two land based wind turbines. Offshore wind is the new money hole that by contrast makes a Super Yacht seem affordable. While media outlets embrace offshore wind, confine arguments to “NIMBY”, the “Koch Brothers”, the public lacks the facts and the devil exists in factual details. The U.S. has adopted the U.K. standard design code for offshore wind turbines. Deepwater Wind has experienced public safety, wind turbine failure and cable issues. Cable problems account for 70-80% of offshore wind insurance claims. The average repair cost for offshore wind cable is $6.5 million according to the insurance industry. The wind industry exits only due to public subsidies that also happen to attract organized criminals. Graft and greed undermine the deployment of reliable energy sources that are commercially reasonable. Early on in the push to get all of into electrified cars, an article in the local newspaper quoted a spokesperson of one of our big electric companies as saying that if just “half” of the people in the Greater Phoenix (AZ) area purchased electric vehicles, the power company would require another coal-fired power plant to supply the increased demand for electricity generated by electric car ownership. It’s a known fact — but denied by the mainstream liberal media, that we cannot run an economically viable country on wind and solar. Very few solar users in AZ — a state where it if were a viable, cost-effective option we’d all have solar panels. But it’s not and we don’t! Once you have everyone on electric cars ..what happens when SOCAL decides to shut us down like they just did for a day without notice. They take the money quickly…how dare they decide to shut down the grid for 10 thousand plus people uncluding those who need oxegen or treatment and have no generators… What about hundreds of dollars of food in the freezers….traffic lights, computers, cell phones …..Do you think with all the law suitsagainst southern califorinia will be worth what they think they will save? Are you sure you want to get in bed with them? They’ re an unreliable source of power sad to say. They never used the monies they ask for in propositions or from the government to finally bury the electirc poles and telephone lines, some costructive move rather they choose to just ‘shut the power off’….we are archaic and an embarrassment to the world! !